Do you want the VERY BEST 20 inch mountain bike available for your little shredder? If so, you want the Trailcraft Blue Sky 20. The Trailcraft Blue Sky 20 is hands-down the best 20-inch cross-country/trail-oriented mountain bike on the market today. The top-end Pro Deore model weighs a mere 19 pounds while offering all the goodies: 80mm of air sprung travel, Stans tubeless wheelset, Shimano Deore hydraulic disc brakes and drivetrain, and beefy Vee Crown Gem tires. 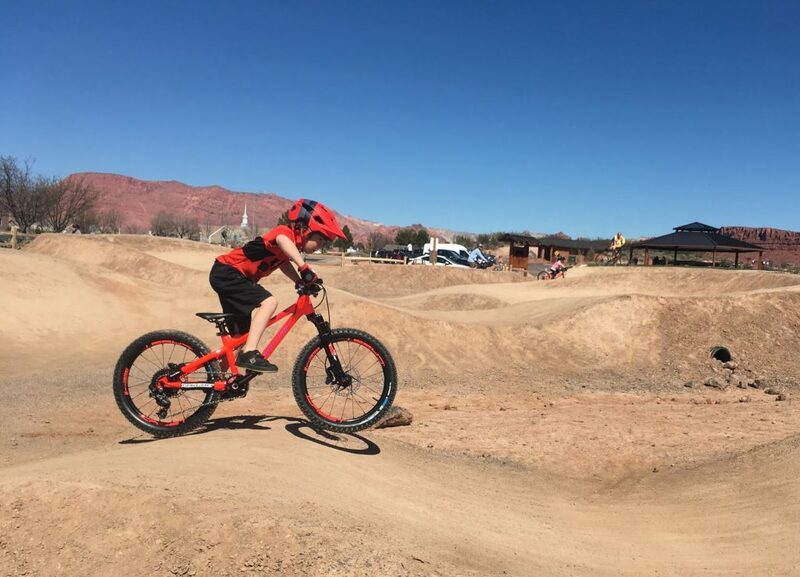 While many parents will read this review and scoff at the pricetag, there’s another group of parents that will read this review knowing that you can’t put a price tag on the joy of maximizing your child’s development and enjoyment of mountain biking. 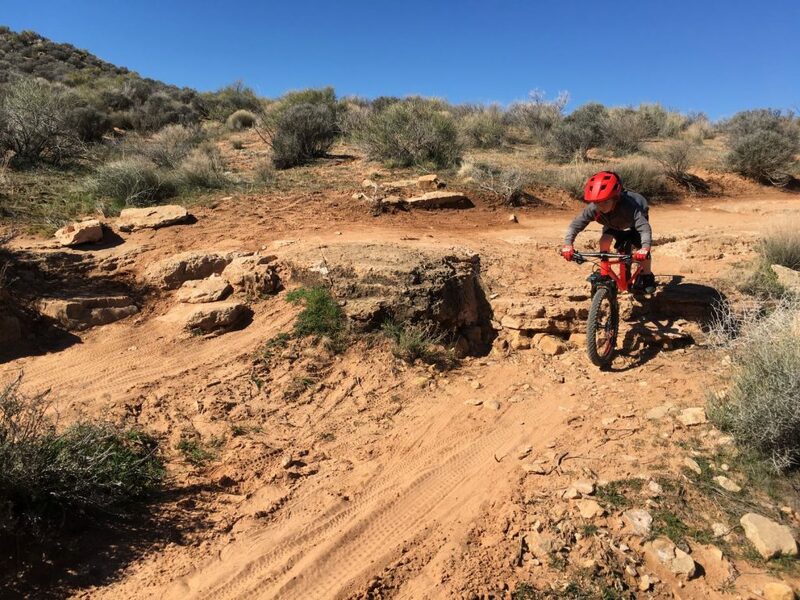 As a kids bike reviewer and avid mountain biker, I know firsthand how important it is to buy your child a good bike. That said, even I had a bit of heartburn over the cost of this bike. Day 1 on the trail, however, was like a big dose of Zantac. It was immediately obvious that the investment was worthwhile when our son’s riding improved overnight. The light weight and high-quality components allowed him to climb faster, ride further, and tackle more challenging terrain than ever before. The Trailcraft Blue Sky 20 comes in three different frame colors (all bright and flashy), two different component builds, and two different chainring size options. They are also willing to work with you on additional customizations should you so choose. We chose the more expensive Pro Deore model, and that’s what this review is based off of. Why did we pick the insanely spendy option? Because we wanted to go as light as we could, and a bike this light is worth every penny, in our opinion. Should you want to save a little dough, Trailcraft also offers a slightly cheaper “TCZ” build ($1,449) that only costs you around a pound. Still a super light bike and a nice build. Let’s start here, because no matter how snazzy the bike is, the best thing about it in my book is how light it is. There isn’t another 20-inch bike with 80mm of front suspension and disc brakes that comes close. If you think a couple pounds doesn’t make that much of a difference, I invite you to come watch my son ride. He’s able to climb considerably faster on the Trailcraft than he can on his other suspension bikes. While there are other bikes that perform just as well on downhills and flats, the Trailcraft is the clear winner on big climbs and long trail rides. If you live in a part of the country without much climbing, the extra cost for a lighter bike might not be justified. But if, like us, you live in the Rocky Mountains or somewhere else with big climbs, every half pound makes a big difference. After weight, the tubeless wheelset was the next biggest draw for me. Like I’m sure you have, I’ve been riding tubeless for the last decade and can’t imagine ever going back to tubes. Dealing with flats on my son’s bikes over the past few years has been such a pain. No more! 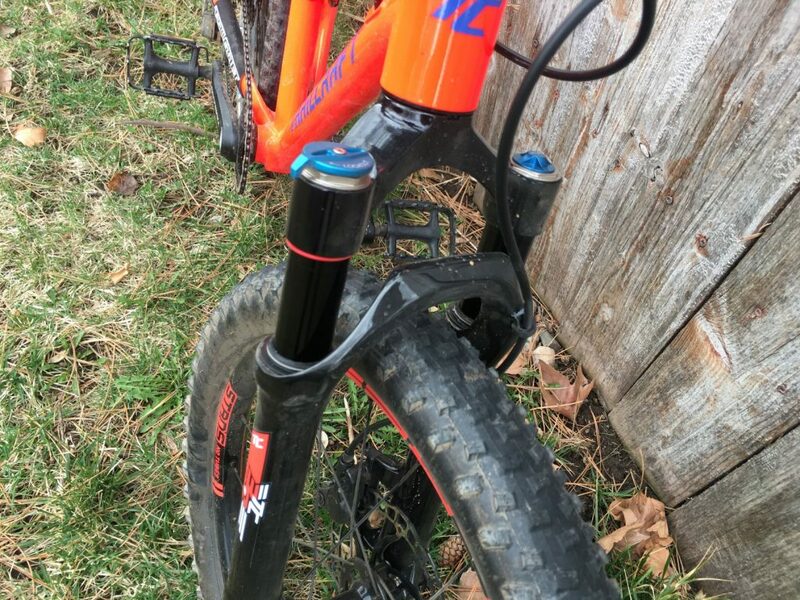 The Blue Sky 20 comes with tubeless ready rims and tires, and upon the request, they’ll send the bike to you setup tubeless already. The Stans rims are seriously gorgeous, and match the paintjob of the bike. Seriously, these babies are spiffy and pics online can’t do them justice. The only minor drawback about this wheelset is the lack of a thru-axle. 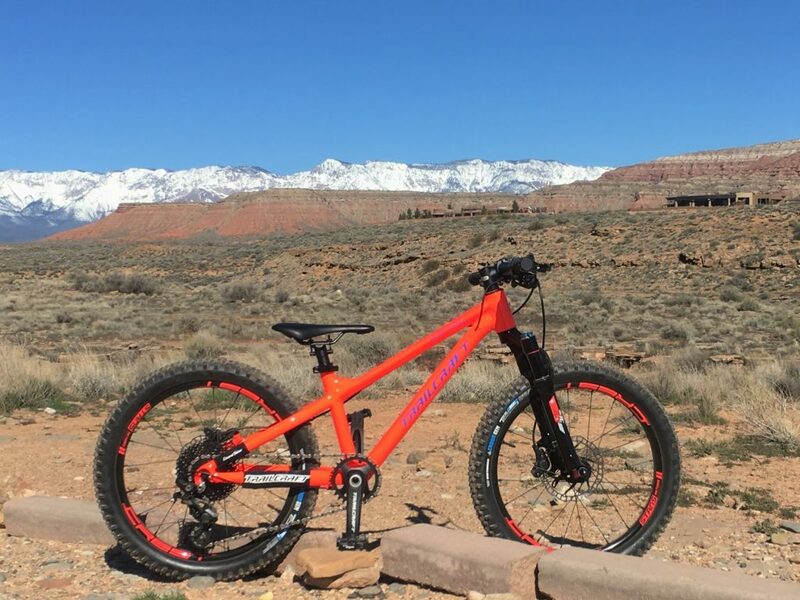 Several other 20 inch mountain bikes, like the Prevelo Zulu Three HEIR and the Spawn Yama Jama, offer this technology so the lack of it on the Trailcraft is a bit of a bummer. Chances are, you’ll be upgrading your child to their first ever bike with suspension. Let me tell you what a game changer that is! 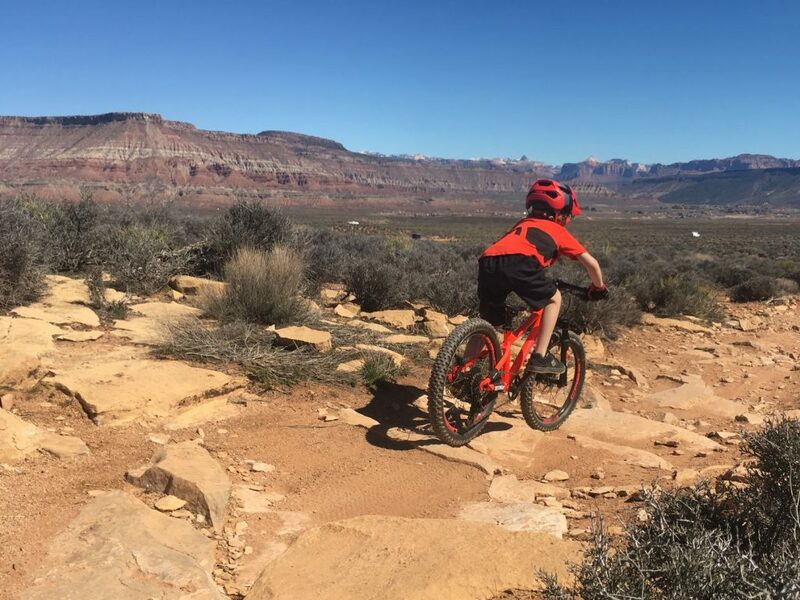 Your child will instantly be able to ride more challenging terrain with less arm fatigue and hand numbness. After switching to bikes with front suspension, we went from LOTS of breaks on trail rides to almost none. (Well there are still breaks, but they are to play in creeks and eat snacks rather than to shake out arm pump). The TC30 fork is the lightest 20″ fork available. (So claims Trailcraft, we didn’t weigh it seperately, but based on the bike’s overall weight we’ll assume this is a true statement). It has 80mm of travel which we’ve found is more than enough for kids this age. It has carbon/alloy lowers, a lockout switch for big climbs, and the ability to adjust the preload. Setup was the same as any other high-end adult air fork. It took a couple of minutes with the shock pump, and the kiddo was off and rollin’. 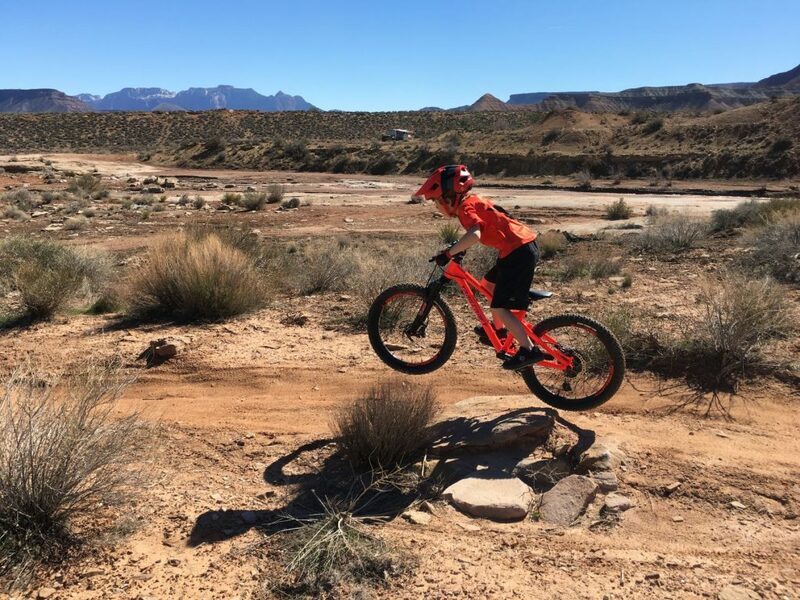 Just like upgrading from a rigid fork to a suspension fork can make a difference in your child’s riding, so too can upgrading from v-brakes to disc brakes. Expect another big over night improvement in riding just as a result of having better braking power and modulation. The Shimano Deore M6000 hydrualic disc brakes on the Trailcraft Blue Sky 20 are superb. 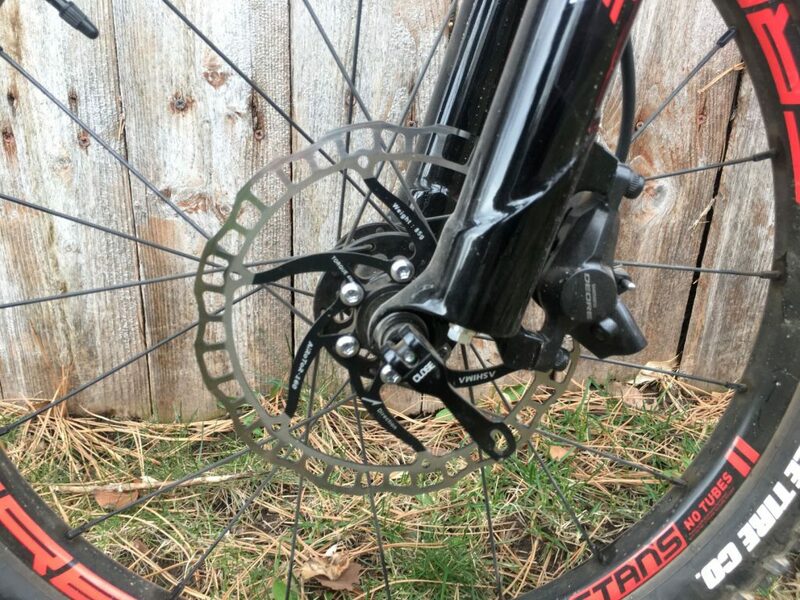 These are a big step up from the entry-level Tektro hydo disc brakes found on a lot of kids mountain bikes. We really appreciate the short-reach levers with easy adjustment. They are easier to reach and to operate than the Tektro brake levers. For little hands, these levers rock. The stopping power and modulation of the system also rocks. I found that there was plenty of stopping power for all of my 125 pounds. (You’d better believe I test these bikes out myself). While we haven’t had to bleed the brakes yet, I’ve been told from reputable sources that they are super simple to bleed via Shimano’s One-Way Bleed system and some mineral oil. 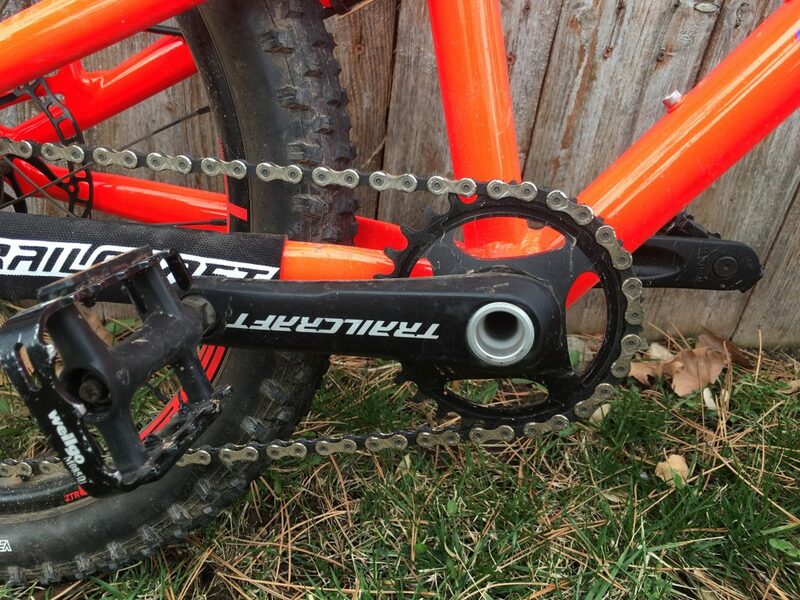 Like everything else on the bike, the Blue Sky’s drivetrain is top-notch. The Shimano ZEE rear derraileur is pretty rad. It features a clutch (I didn’t have one of those until I was 30), and a short-cage to compensate for small wheels and less ground clearance. The shifter is Shimano Deore (M6000 I-Spec), and is exceptionally easy for little hands to operate. It also results in nice clean shifts, and we prefer it to the Shimano ZEE shifter that comes on the less expensive Blue Sky model. 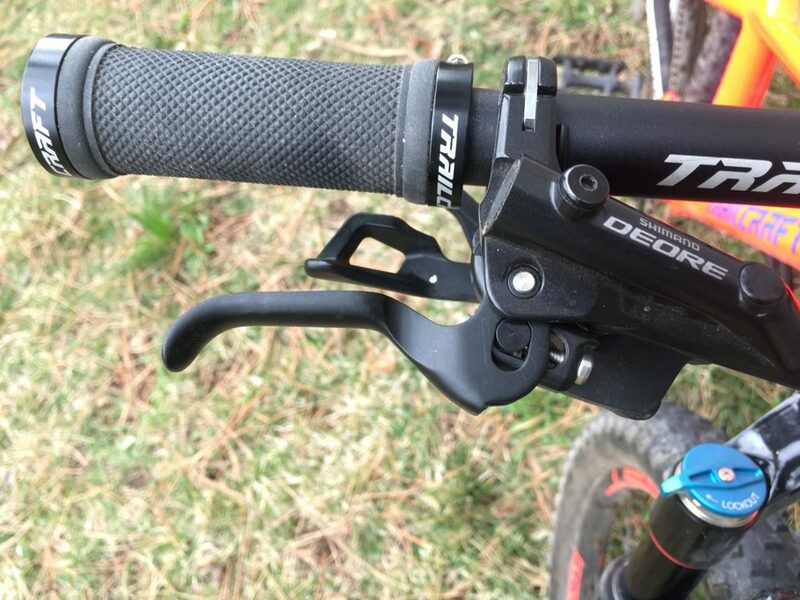 We also like that it integrates with the Shimano Deore brake lever so that they mount to the same bar clamp. As far as gearing goes, you have plenty of options thanks to the ability to choose from either a 28T or 30T front chainring. We chose the 28T chainring due to the fact that we have lots of climbing here in Utah, and are super happy by that choice. On our son’s bikes with a 30T front chainring, we’ve found that we have to hook up the TowWhee a lot sooner than with the 28T chainring. The rear cassette ranges from 11 to 36 teeth, and the crankarms measure at 127mm. With a 30T front chainring, that gives you a gain ratio between 1.87 – 6.14. With the 28T front chainring, you have a gain ratio between 1.75 and 5.73. (All you tech nerds can double check my math there). We already mentioned the awesome-sauce-ness of the tubeless setup on the Trailcraft Blue Sky 20, but we didn’t mention yet just how great the tires are. The 20 inch tire du jour right now is the Vee Crown Gem. And for good reason. 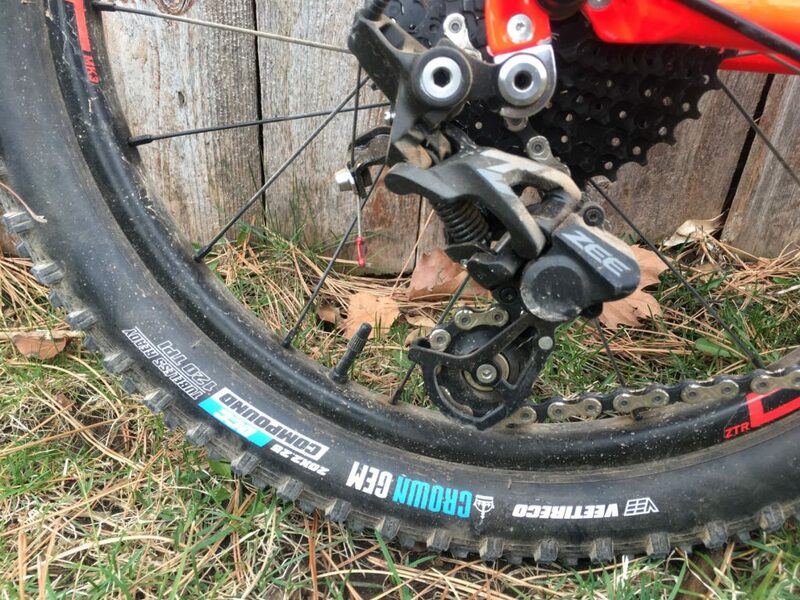 It’s tubeless compatible, has great traction and high volume. In fact, for a 20 inch wheel a 2.25 tire is essentially the equivalent of a plus-sized tire on an adult bike. The high volume and lack of tubes, means that you can run the tire at a super low psi. This adds additional traction, less rolling resistance, and additional bump absorption. For a bike that’s pretty much perfect in every way, the pedals are a bit of a letdown. The platform is tiny and slippery. On his inaugural ride, my son’s feet must have slipped off 10 times, even with his grippy FiveTen Freeriders. All I can figure is that Trailcraft assumes that each customer will want to upgrade to a pedal of their preference. While this is true on an adult-bike, I’m not sure it’s quite as true on a kids bike. It would be rad if the bike came standard with a nice-quality platform pedal. While this might be a bit knit-picky, the only thing we don’t love about the Trailcraft Blue Sky 20 is that it doesn’t have routing for a dropper post. I mean this bike has everything else, why not give us the option to add a dropper as well? We’re probably still going to add a dropper, but it won’t be as clean. If you want internal routing for a dropper, consider the Spawn Yama Jama 20 instead. Trailcraft has hit a bit of a sweet spot with the Trailcraft Blue Sky 20 as far as geometry goes. Nearly identical to the front triangle geometry on the Prevelo Zulu and the Spawn Yama Jama, the Trailcraft Blue Sky 20 sports modern mountain bike geometry that is slack enough to tackle technical downhills but agressive enough that the bike can be used for cross-country racing as well. The bike does have shorter wheelbase and chainstays than it’s competitors. While theoretically this means that it’s less stable, it also means that it’s more nimble and playful. I can’t say we noticed a stability issue but it is certainly playful, so we’re declaring the design a winner! Trailcraft advertises the bike as appropriate for kids ages 5 to 8. This is obviously going to be very dependent on how tall your child is, how long their legs are, and their physique. (More muscular kids are going to be able to handle a bigger bike sooner than more petite children). As for our son, he is 6.5 years old, slender and wears a size 6 pant. He is riding with the seat lowered nearly all the way and the bike is still a tad bit big for him. I still think he’s ready for the bike, but I certainly wouldn’t have wanted to push it on him any sooner. The minimum inseam length for the bike is 21 inches. Internal cable routing keeps things looking spiffy and clean. The bike comes with a quick-release seatpost collar which we always appreciate. Trailcraft lock-on grips and saddle get the job done. Nothing super special to say about either but they seem good enough. The Trailcraft Blue Sky 20 with Deore build doesn’t really have a “closest competitor” because it’s in a league of it’s own–in terms of price, build, and weight. Still, there are a couple of other really nice 20-inch mountain bikes you should consider as well. These include the Prevelo Zulu Three HEIR, the Spawn Yama Jama 20, and the Flow Kids Bikes 20″. 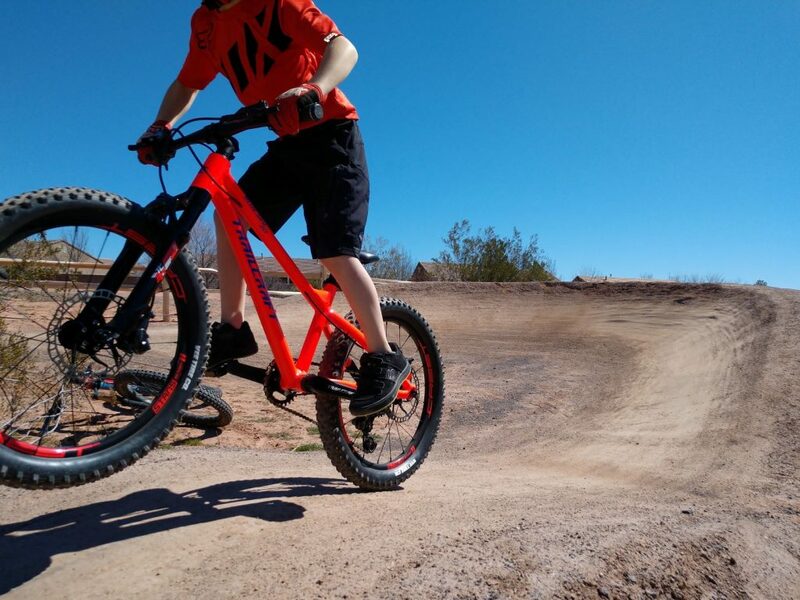 For even more options, check out our article on the best 20″ mountain bikes for kids. Is There Anybody I Wouldn’t Recommend the Bike For? The Trailcraft Blue Sky 20 definitely has a cross-country orientation so it’s going to be best for kids who spend most of their time riding trails and or hitting up the pump track. 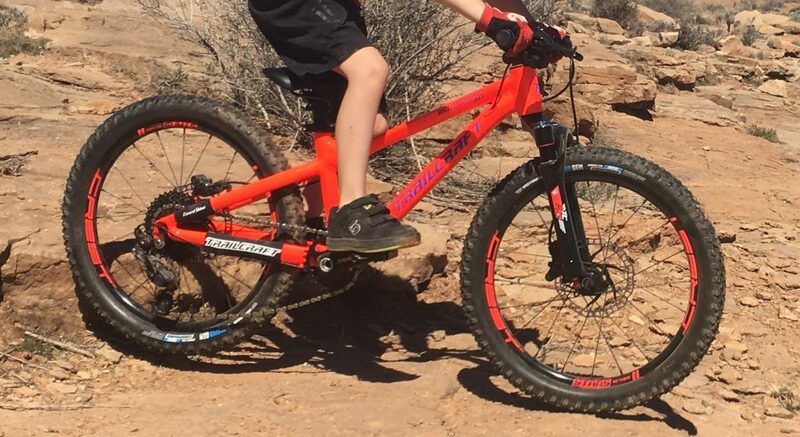 If your child does a bunch of lift-served or downhill riding, they will be better served by a full-suspension 20 inch bike like the Spawn Rokkusutta or the Norco Fluid. On the other side of the spectrum, if your kiddo is mostly looking for a bike foraround town riding with a little dirt and gravel mixed in, the Trailfcraft is probably overkill. Opt for a bike like the Cleary Owl instead. 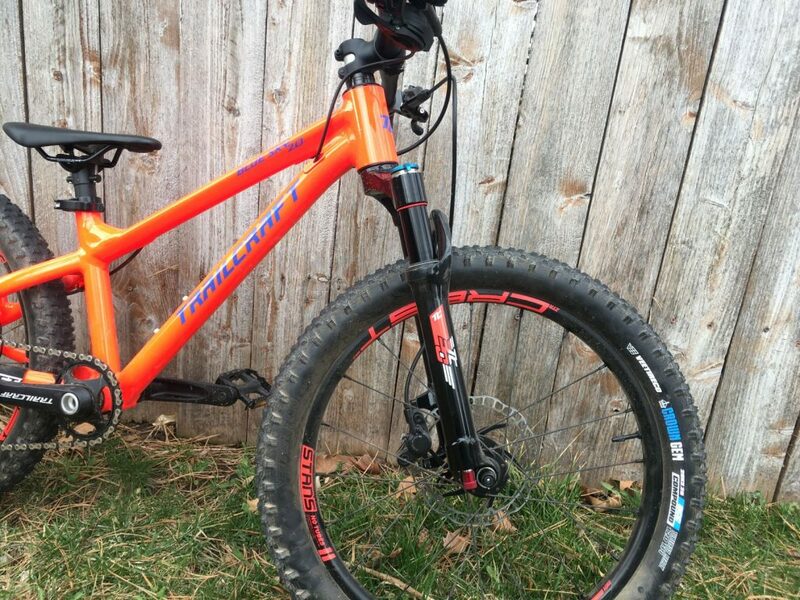 No, the Trailcraft Blue Sky 20 isn’t cheap, but this isn’t a cheaply made bike. The price reflects the high-quality of the bike’s build and the quality of the ride. If you value mountain biking and want your children to value mountain biking as well, this is the bike for your family. The sub-20 pound build, in and of itself, makes this bike a worthwhile purchase. Add in the tubeless wheels, suspension fork, hydro disc brakes, and other assorted high-quality components, and you’ve got a bike that’s worth every penny. Doubtful? Beg, borrow, or demo one of these babies and see how much better your child rides. Can’t get your hands on one? You’ll just have to trust me: my son improved literally overnight. Shopping for a 20″ mountain bike? Here are some other posts that might help you.